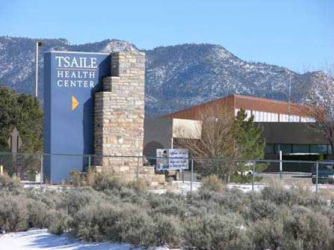 Tsaile Health Center is located in Northeast Arizona as a part of the Chinle Service Unit. This ambulatory care center is situated at the base of the Lukachukai Mountain rage with local elevations of 7,000 to 8,000 feet. Two lakes are within 10-15 minute drive which offer camping, fishing, and non-motorized boating. The Tsaile Health Center has 9,031 registered clients. Clinic hours are 8:00 a.m. to 5:00 p.m. Monday through Friday (closed on holidays). Weekend work is limited to two 13 hour emergency room shifts per month at the main hospital (Chinle Comprehensive Health Care Facility), 25 miles west of the Health Center. The Health Center is adjacent to Navajo Community College, the first Indian Tribe-controlled college established in the United States. Routine outpatient services are provided to a broad range of patients including prenatal and geriatrics. The clinic is staffed with 3 physicians and 1 physician assistant with the health center total staffing of 53. The Navajo Nation is the second largest federally recognized tribe in the United States (Cherokee being first). There are approximately 298,000 members nationwide, 168,000 members reside on the reservation with half of the population under age 25.